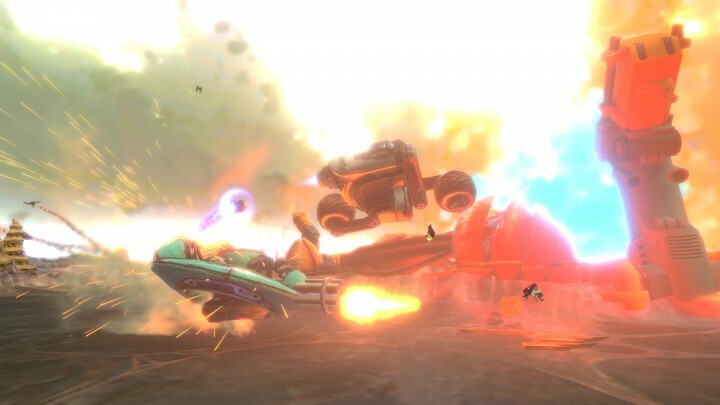 Targem’s latest outing, BlazeRush exploded onto the PS3 and Steam today, a crazy manic top down racing game with combat elements, an emphasis on single screen insane multiplayer matches, item pick ups, and an abundance of explosions with the aim of hurling your opponents from the track. Sound familiar? The game bears a slight resemblance to Codemasters’ fantastic top down racing series, which features item pickups, an emphasis on single screen insane multiplayer matches and the aim to throw your opponent off the track, or at least get them stuck long enough so you can storm past and win. Though that said many famous isometric racing games like Rock n Roll Racing share at least a little with Blaze Rush. The game, unlike a lot of similar party racing games like PAM has a focus on simplicity, which isn’t surprising coming from the folks who designed the addictive and simple strategy game Planets Under Attack. 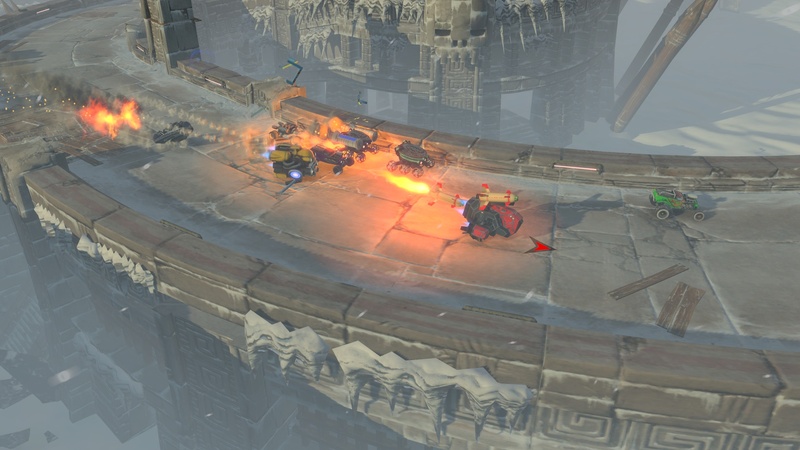 To that end the game has what they term “a very simple pick up and play control style” and support for four local players and up to eight online players, with the kind of “drop-in, drop-out” lobby system that games such as Awesomenauts have used to great effect. There’s also a 4 Player Co-Op campaign mode, which is somewhat intriguing if only to see how you balance a manic racing game where you play half the opposition. With three game modes and sixteen unique vehicles, it doesn’t appear to be the deepest game, although that could very well be a part of the streamlining process, with Race, Survival and King of the Hill modes being fairly self-explanatory. Targem games have a habit of really pleasantly surprising, so one can be hopeful this will have some bang for your buck to go with all of those explosions.